On Thursday, October 13, 2016, Glenn Page of FTZ Solutions, and David Trumbull of Agathon Associates, appeared as subject matter exporters on behalf of Gino Marconi, Director of Ports and Harbors, Pease Development Authority (Foreign-Trade Zone #81) at the Fourteenth Annual Governor’s Advanced Manufacturing and High Technology Summit, held in Concord, New Hampshire. 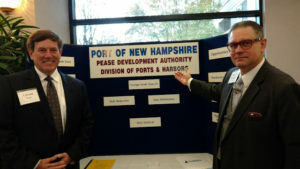 Page and Trumbull conducted one-on-one discussions with New Hampshire manufacturing companies regarding the potential for cost savings using FTZ procedures for production, warehousing, and distribution activity. Recently the team assisted a textile manufacturing in Massachusetts to have $200,000 per year, and hire 20 new workers, using FTZ procedures.